I just read the news about several fires burning in Grand Teton National Park. 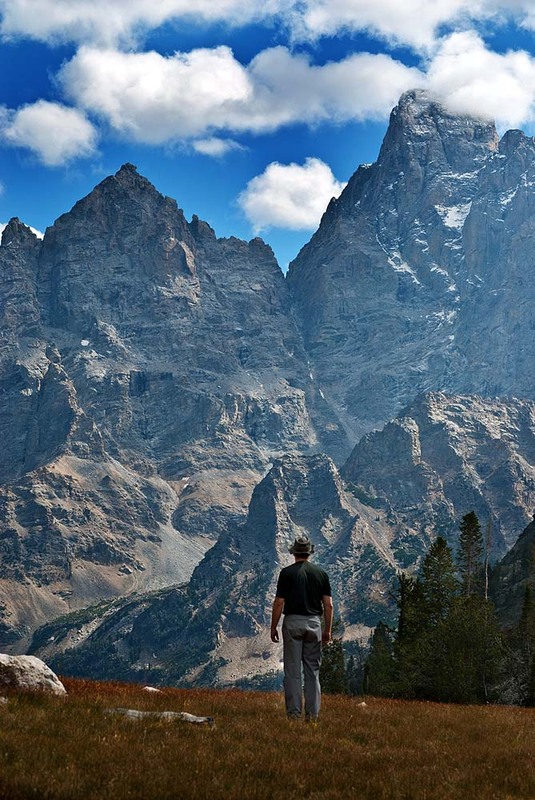 Two years ago, I was fortunate to go on a three-day backpacking trip through the Tetons with some friends. It was a crisp fall weekend in September. The trees were bursting in fall colors and the trip was amazing. Given the news about the Grand Teton National Park fires I thought I would share a post with details from my backpacking trip as a reminder of the pristine beauty of our National Parks, and how blessed we are to live in a country that puts a priority on preserving such beauty. SS and JH (my two friends who may want to remain anonymous), pick me up to begin our weekend backpacking adventure through the Tetons. Our plans are to park just north of Jenny Lake, in the String Lake parking lot. We will hike about half way up Paintbrush Canyon and will spend our first night near Holly Lake. We will spend the next two days hiking down into Upper Cascade Canyon and will camp near Lake Solitude. On the final day we will complete our loop and hike past Jenny Lake back to our car. The weather is bad, bad, BAD. It is raining off and on and the weather report and radar over the Tetons shows serious thunderstorms the rest of today and through the night. We are going to do our best to Embrace the Bad Weather and have a good, and hopefully, dry time anyway. We stop at Fall Creek Falls on the South Fork of the Snake River. The colors are beautiful and the waterfall is stunning. Best part is the rain has stopped for a few minutes allowing some light rays to fill Swan Valley. We stop at the Ranger Station/museum and talk to a Ranger at the Permit Section to pick up our permits/reservations for our backcountry campsites. We aren’t allowed to camp just anywhere. There are specific sections along the trail that are reserved for campsites. There is so much traffic that we had to reserve campsites in advance. Despite being in the “off season” we learn that we are lucky to get campsites reserved. The trail is busy this weekend and a lot of people were not granted campsite permits. These people would simply have to hike through the entire 18-mile trail loop in one day. We brag to each other about how prepared we are. Then we go to Section 2 to rent bear canisters. Here we get an update from a different Ranger about the area we will be hiking in. A bear has been sighted in the upper end of Paintbrush Canyon, near our reserved campsite, making it off limits. Our previous reservation is now meaningless and we will have to scramble to find a different campsite. Before we can leave the Ranger Station/museum we have to stop in Section 3 and watch a movie about bears. Details about bear safety and bear attacks and surviving in the backcountry are displayed on a big screen before us. Descriptions of bear attacks and individuals who have survived them leave us rattled. The rain starts to fall just as we are leaving. After a quick lunch of Buffalo Burgers (real buffalo burgers), we arrive at String Lake. Rain pours down on us. During a break in the storm I run up to the shore and get a shot with the Grand Teton in the background. The rain really starts coming down. We huddle under a small shelter at the beginning of the trailhead containing the maps of the trail that we will be hiking. While standing there 2 women come down the trail that we’re about to hike up and join us under the shelter. They just finished hiking the entire Cascade Trail and Paintbrush Canyon. Essentially they did the same loop we were about to do, but in reverse. We peppered them with questions. Yes, they saw the bear. No, they do not think it was a grizzly bear. Yes, the campsites in upper Paintbrush Canyon were closed. Yes, all the other campsites appeared to be full. No they did not see any empty campsites available. Yes, it was a rugged, challenging hike getting up and over the pass out of Cascade Canyon and down into Paintbrush Canyon. They were glad their hike was done. The rain turns to a slow drizzle. We pull on our rain parkas and hike about 3 miles up Paintbrush Canyon, about 2 miles and 1800 or so feet lower than we had planned. However, we lucked out and found a great campsite and set up camp. SS and JH make themselves dinner while I run around getting photos. All of us are a little afraid that we are about to get drenched by the ominous-looking storm clouds overhead. From the East I can see a storm moving in. Then, suddenly it begins to hail on us! The hail is the size of large marbles. Lightning strikes several times higher up in the canyon. The thunder sounds like cannons firing! We use a small trowel to create a trench to drain the water away from the base of our tent. Then all of us huddle under a thick stand of trees to try to stay as dry as possible until the storm passes. The storm breaks for a moment and we climb into the tent and our sleeping bags. SS has a nightmare and starts screaming in his sleep. Even with my earplugs in I can hear him. In my sleepy stupor I panic thinking a grizzly bear is dragging him out of the tent so I grab his arm to pull him back in. I pull furiously in a tug-of-war with the grizzly bear . . . only there was no grizzly. It was just SS’s scream and my overworked, sleep deprived, imagination. JH laughs at us both. SS and I do not think it’s funny, until the next morning. Then only SS thinks it’s not funny. I run around camp getting amazing photos of rolling fog and early morning light. It’s a dazzling display of Mother Nature’s beauty. We hike for about an hour and climb above the fog. The canyon ahead of us is bathed in early morning light and the fall colors nearly overwhelm our senses. We hike nearly two miles and are just above the area where we originally had permits to camp. This means we are near the area the bear was sighted in. A couple of hikers come down the trail and tell us that they indeed did see the bear. We are on high alert. We pull out our bear spray canisters and I get my camera and lens ready. Slowly we move up the trail . . . and then we see it. It is a black bear. (Sigh of relief!) It stays in a thicket of trees and evergreens and it looks like it’s eating berries or bugs or something small. We are about 75 yards away from it and I use my longest lens to zoom in for a shot. The light is bad, the location is bad, and the bear is mostly covered by vegetation, but I’m still thrilled to get a photo of a bear in the wild! After warning other hikers who are coming up the trail behind us, we move on. We head down into Cascade Canyon and pull up next to Lake Solitude for a rest. Some ominous storm clouds rolled past us here but in the end it was a beautiful, blue sky day. We are surrounded on all sides by rugged granite mountains. The beauty is overwhelming. We set up camp and then I run around with my camera and lenses creating photos of the location and scouting out a good spot to capture sunset light on the east side of the Grand Teton. The light begins to change and for the next half-hour I take a series of photos of the Alpenglow on the Grand Teton. It is an amazing sight! The colors get deeper and richer and I’m amazed at the rugged beauty of it all. The sun is down and the light is beginning to fade quickly. I’m just about to pull my camera off of my tripod (yes I packed a tripod with me which you can see next to SS in one of the photos above) when I notice of movement down below me. I freeze, worried that I’m about to encounter another bear. When I see the movement again I realize it’s a mule deer. It’s coming up along the same game trail I am standing on. My tripod is in front of me and I slowly reach out for my camera and capture a few photos of the deer as it moves past me. With SS and JH in the tent using their head lamps I create a shot of our glowing tent, with SS’s silhouette and the rugged mountains behind. The photo attached below is small but in a larger version you can see stars in the sky. We sleep in a little and then break camp on the last day of our adventure. As we are reaching the lower end of Cascade Canyon JH stops suddenly in the trail. We all look down and see a huge bull moose only about 30 yards away. It’s bedded down in some grass and doesn’t seem to be too disturbed by us. Careful I get a few photos of the bull moose before moving on. We push on down the trail and finally arrived back at String Lake where our car is parked. It’s been nearly 48 hours since we began our hike. In that time we were rained on, hailed on, lightning struck around us, we saw a bear, a deer, and a moose, along with other wild animals. We hiked over 18 miles, past high mountain lakes, snow, and rugged granite peaks. The brilliance of fall colored leaves surrounds us. It has been AMAZING!!! As we make the long drive back home recounting our experiences, we all agree that having such beauty available to anyone willing to hike it is a blessing of incalculable value. We count our blessings for getting to hike it ourselves . . . and that SS wasn’t eaten by a grizzly after all. Ha ha! Thank you for reading my adventure. If you have any questions or comments, I’d love to hear from you.